Combining shelving with drawers improves security, convenience, and space efficiency. 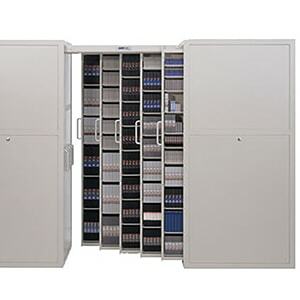 Modular Drawer and Receding Door Systems combine the accessibility and security of filing cabinets with the space efficiency of open high density shelving to store more materials per square foot of floor space. 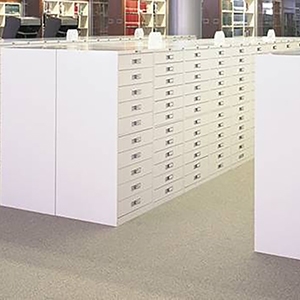 Increase your storage capacity even more by using our shelving with modular drawers on Spacesaver high-density mobile storage systems. Filing cabinets have gone the way of the typewriter or steno pool. Looking to update your storage? Download the Shelf with Drawers brochure to see the breadth of options for sleek, secure, space-efficient combination shelving.